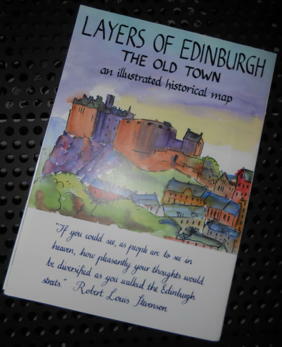 I recently bought Eleanor M. Harris‘s historical map of old Edinburgh, and have now had a good chance to look through it. I developed a strong interest in urban history, and Scottish urban history in particular, thanks to my PhD supervisor Professor Charles McKean, and also the taught PG Masters course I did beforehand in Cultural and Urban Histories 1650-1850. Plus being born in Edinburgh I was always going to be interested in this map! Eleanor did all the artwork and wrote the text, including the calligraphy work, herself. It’s impressive how much she has squeezed in. 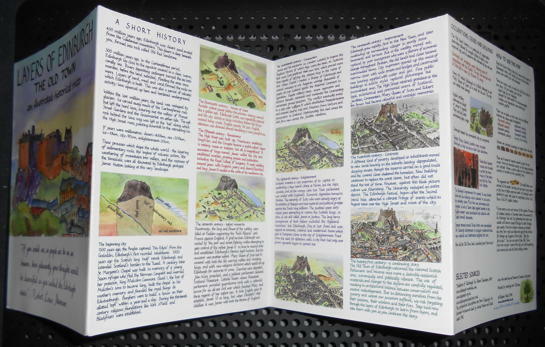 The map unfolds to open with a so-called “short history” of the city, but it’s full of detail, from the earliest dates through to the 21st century, and gives a good potted account of developments over time. But the bulk of the content is on the map proper, on the other side, accompanied with notes about specific places and people. The emphasis is very much on the Old Town, so there isn’t for example any content on the map from Princes Street and further north, the area developed so much in the 18th century. What is there though is generally well presented, with colour coding to show different dates of development, as well as numbers which can lead to further information in the notes section on the back of the map. If I have one criticism, it’s a small one, but much of the text on the map is written at all different angles, which can mean you need to turn it around a lot to read the contents. But that’s sort of necessary, given how much information has been squeezed in. And I don’t think it would be a problem using the map in the field so to speak. For anyone with an interest in Edinburgh’s history, or urban history in general, I strongly recommend that you get hold of this map. If you can use it on the ground, and explore the streets with it to guide you, all the better. 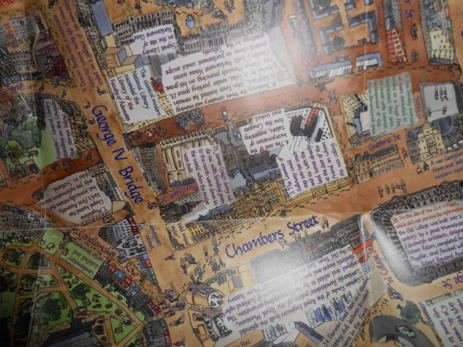 Copies of the map are available from Eleanor’s Etsy shop.